‘Global Health’ is very much in the news with the Ebola outbreak in Western Africa. We tend to take the notion of such global health initiatives for granted now but David MacFadyen’s research reminds us that this was not always the case. I carried with me, for four decades, an index reference card on Melville Mackenzie, an inspirational figure in the field of global health. It was only in 2010 that I learned of the existence of a family archive of Mackenzie’s letters and papers. I felt it a privilege to be given access to this source by the family, so I enrolled as a (very) mature graduate student at the University of Glasgow’s Centre for the History of Medicine. In 2014, I completed a doctoral thesis on The Genealogy of WHO and UNICEF and the Intersecting Careers of Melville Mackenzie (1889-1972) and Ludwik Rajchman (1881-1965). During the 1921/1922 winter famine in Bolshevik Russia, Mackenzie described the emergence of a new type of international health organization, one in which nations acted collectively. His letters and personal papers allow us to observe how global health developed, defined here as collective action by nations to advance the health of the world population. 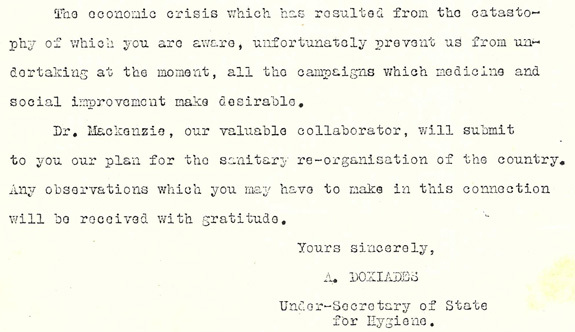 Extract of request from Apostolos Doxides in 1928 to the Director of the Health Section of the League of Nations. Wellcome Library reference: PP/MDM/A/3/1. Image credit: Andrew Mackenzie. During the winter of 1928/1929, Mackenzie served in Greece as Secretary-General of an LNHO Commission that elaborated a carefully-prepared plan to reform the country’s health services. Mackenzie was then assigned a similar task in Bolivia in 1930, by which time the LNHO had entered into an era of collaborating broadly with national health authorities, rather than assisting them narrowly to control one or more diseases. That same year, LNHO Director Ludwik Rajchman launched a decade-long period of technical cooperation with China, to help the country organise a system of health services for its huge rural-based population. The country reported its achievements in 1937 to the Bandoeng Intergovernmental Conference of Far-Eastern Countries on Rural Hygiene. The Sino-Japanese war erupted in 1937, a year that marked a decline in Rajchman’s authority concerning China. It fell to Mackenzie to organize the logistics of LNHO’s largest health intervention within the sovereign borders of another country. The Secretary drew him into an intrigue against Rajchman by appointing him to chair a Purchasing Committee, which deployed augmented funds allocated by the League of Nations for humanitarian assistance to the invaded country. Extract from a letter to Emma Mackenzie, 20 November 1937, describing Mackenzie’s relationship with Rajchman. Wellcome Library reference: PP/MDM/B/12. Image credit: Andrew Mackenzie. Rajchman departed from LNHO in 1939; Mackenzie in 1940. During World War II, each began to publish and advocate ideas for postwar global health that were widely-different in concept. It was at this point that a fracture seems to have occurred in relations between them. 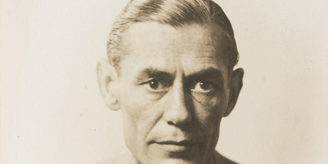 Arrangements conceived by Mackenzie for postwar global health were informed through regular wartime contact with the Swiss head of LNHO, Raymond Gautier and his French colleague Yves Biraud. By 1943, Gautier had formed the view that the purpose of an international health organization was to promote ‘health for all’. He and Biraud incorporated their concepts in a joint submission of a preamble and constitution for a postwar international health organization that is almost identical to the document presented in 1946 to a Technical Preparatory Committee (TPC). It is substantially this text that emerged as the Constitution of the World Health Organization (WHO). Mackenzie (second left) was Alternate to Chief Medical Officer Wilson Jameson (on his left) on the 1946 Technical Planning Committee. Wellcome Library reference: PP/MDM/A/3/3/1. Image credit: Wellcome Library. In June 1946, Mackenzie wrote to his wife from New York, informing her that he was attending “by far the biggest international health conference ever held”. Towards the end, he added: “you will also be amused to hear that, yesterday, by an overwhelming majority over all other candidates (3), I was elected Chairman of the General Drafting Committee, the votes were 31, 6, 2 and 1”. 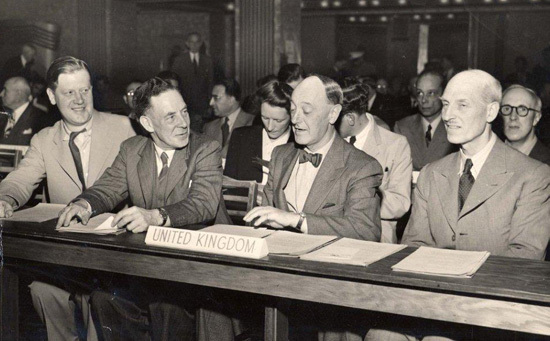 In July 1946, he wrote her an excited note concerning a document he had just received: Secretary of State for Foreign Affairs, Ernest Bevin, had given Mackenzie “full power and authority to agree and sign any treaty in connection with the World Health Organization”. On 22 July 1946, Mackenzie presented the Constitution and related documents at the final plenaries of the Conference and signed the Constitution, without reservation, on behalf of the United Kingdom of Great Britain and Northern Ireland. Rajchman’s exclusion from all the preparatory planning of WHO took him on a path that resulted in the creation of an international ’emergency’ fund for the world’s children – UNICEF. As soon as it was formally established (in 1946), UNICEF began to cooperate with individual countries in the fields of health and nutrition. WHO’s governing body, meeting for the first time in 1948, considered UNICEF’s health programmes to be in its own field of competence, a concern that led the two agencies to form a joint committee on health policy (JCHP). The proposal to create the joint body emerged from a WHO Committee on Relations, which Mackenzie chaired. Mackenzie, one of four representatives of the Executive Board of WHO, was elected to chair the JCHP and Rajchman led the four UNICEF representatives. interrelationship between Mackenzie and Rajchman. When they sat across from one another at JCHP meetings, Rajchman and Mackenzie were coming to the end of fulfilled careers (they were aged 67 and 59 respectively). Each could look back, with pride, at their contribution to the structures, policies and practices of global health and child protection that were in place. Although the JCHP was conceived as a temporary body, and born out of inter-agency rivalry, it sustained its collaborative functions and served both agencies well for half a century. 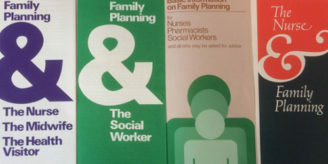 In the last quarter of the Twentieth Century, the two agencies promoted a global ‘Health for All’ strategy, one that aspired to achieve for all citizens of the world a level of health that would “permit them to lead a socially and economically productive life”. Author: David Macfadyen is a Graduate Research Student at the Centre for the History of Medicine, University of Glasgow. Thank you. I did wonder about MacKenzie’s role in the creation of the WHO. When I got to Wellcome, his materials were yet to be catalogued, so it is good to learn about his career from LNHO to WHO.